The use of forage legumes may be 11,000 years old. Some species were first used as grain for human consumption and more recently for fodder or pasture, while for others the reverse is true. Although tropical forage legumes have been grazed in natural habitats for many years, they have only been cultivated for only 75 years. However, some, like Centrosema pubescens, Lablab purpureus and Pueraria javanica were used as cover crops and green manure at least a century earlier. Tropical legumes may have originated from tropical forests and natural grasslands and were later adapted to a variety of environments. Forage legumes are mostly used as cut fodder or grazed pasture. Fodder may be fed directly to livestock or used after preservation as fermented green matter (silage and haylage) or dried for products like hay, pellets or cube concentrates. Pastures may be grazed directly or cut and used in feed rations for livestock. Dual-purpose legumes are important, with crop residues and by-products as a source of feed for livestock, and the grain for human consumption. Forages also have an important role in marginal areas, maintaining the natural resource base through soil stabilisation, preventing soil erosion and contributing to soil fertility through microbial nitrogen fixation and organic matter. 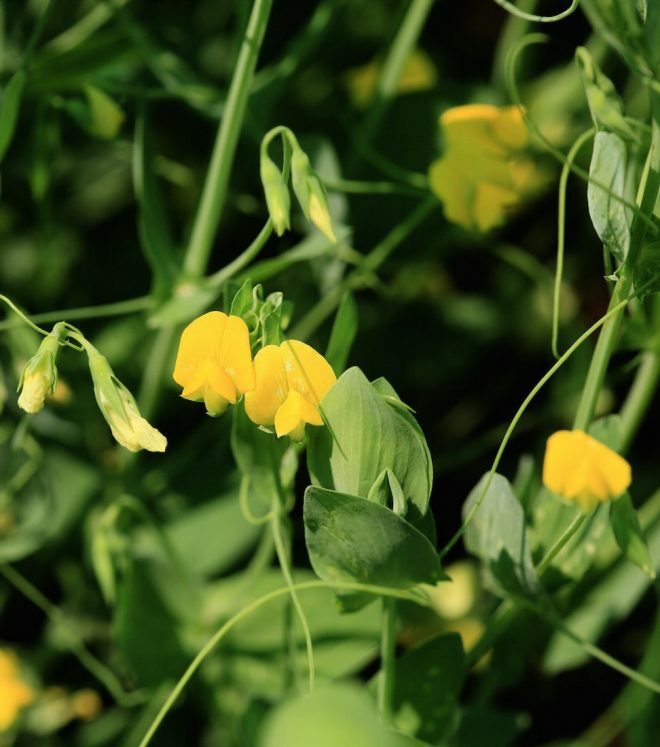 Some forage legumes are also used to control leaching of nutrients from soils and as rotation crops to control pests and diseases of other crops. More than 1,500 species of legumes (from a total of about 17,000 worldwide) can be used as feed for livestock, although only about 60 species have been domesticated and are widely used as cultivated forages. Not all Leguminosae are suitable for forage, as a result, for example, of spines, thorns, woody characteristics or compounds unpalatable or poisonous to livestock. Some plant stems and leaves have glands and glandular hairs or sticky exudates or aromatic compounds that sometimes can limit their use. With such a wide range of diversity, a broad range of methods are required for the management of forage legumes in genebanks. These general guidelines are only indicative and specific information should be sought in the literature whenever possible. The wide range of species covers short-lived annuals to long-lived perennial trees and small herbaceous species to large woody species. Many forage legumes can be conserved as seeds in genebanks. Field collections are also useful. With the great diversity of forage legume species, it is difficult both to generalise and to be specific and a broad range of methods may be used to conserve forage legumes. The tropical forage community have defined priorities in the Tropical Forage Conservation Strategy. ICARDA has the largest collection of forage and pasture legumes in the CGIAR with 36,800 accessions with a focus on medics, clovers and grasspea. CIAT also has a diverse collection of around 21,000 accessions of tropical forage legumes with a focus on Centrosema and Stylosanthes. ILRI’s genebank holds a diverse collection of about 14,000 accessions of legumes from 190 genera with a focus on indigenous highland clovers and fodder tree species. CSIRO, Australia, EMBRAPA, Brazil, and USDA Fort Collins, USA hold important collections of forage legumes. Bogdan AV. 1977. Tropical Pasture and Fodder Plants, Longman, London, UK. Fairey DT, Hampton JG, editors. 1997. Forage Seed Production, Volume 1: Temperate species. CABI publishing. Loch DS, Ferguson JE, editors. 1999. Forage Seed Production, Volume 2: Tropical and subtropical species. CABI publishing. Skerman PJ, Cameron DG, Riveros F. 1988. Tropical Forage Legumes, FAO Plant Production and Protection Series, no. 2. Food and Agriculture Organization of the United Nations, Rome, Italy. Williams RJ. 1983. Tropical legumes. In: McIvor JG, Bray RA, editors. Genetic resources of forage plants. CSIRO, Australia. pp. 17–37. Contributors: ILRI, Ethiopia (Jean Hanson, Juvy B. Cantrell, Janice Proud); ICARDA (Ahmed Amri, Kenneth Street, Ali Shehadeh, Natalya Rukhkyan, Siham Asaad); GRCTPL, Australia (Richard Snowball); Bioversity International/ILRI, Addis Ababa, Ethiopia (Alexandra Jorge); CIAT, Cali, Colombia (Daniel Debouck, Maritza Cuervo). Information on genebank management of forage legumes was gathered from current genebank practices, accumulated experience, literature and websites of major forage genebanks (CIAT, ICARDA, ILRI, CSIRO-Australia, IGER-UK, USDA-Fort Collins, EMBRAPA-Brazil). This information was revised and validated by crop experts. Contact person: Jean Hanson, ILRI, Ethiopia.